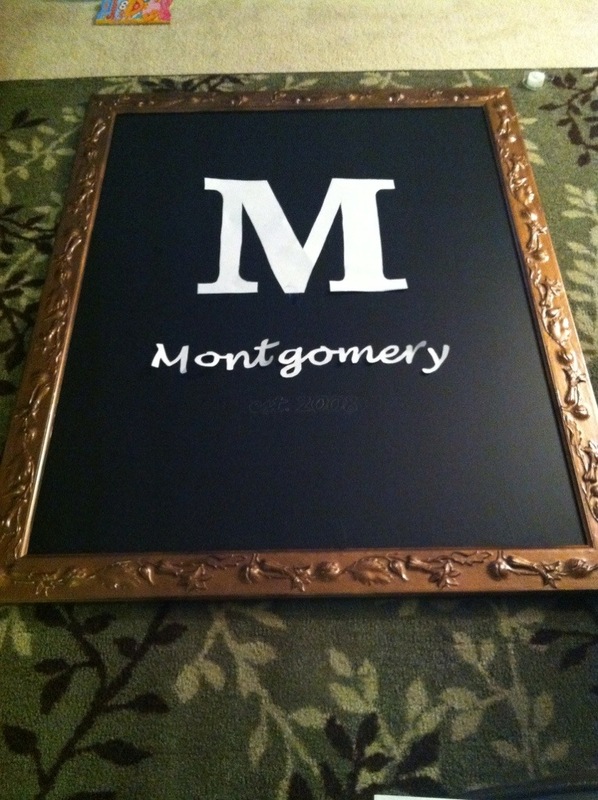 I will freely admit I am obsessed with chalkboard paint and with monograms and personalized items! I would not consider myself crafty, but I was inspired by these ideas on Pinterest, and a glass or two of wine and decided to give chalkboard monograming a try. If I can do this, anyone can. 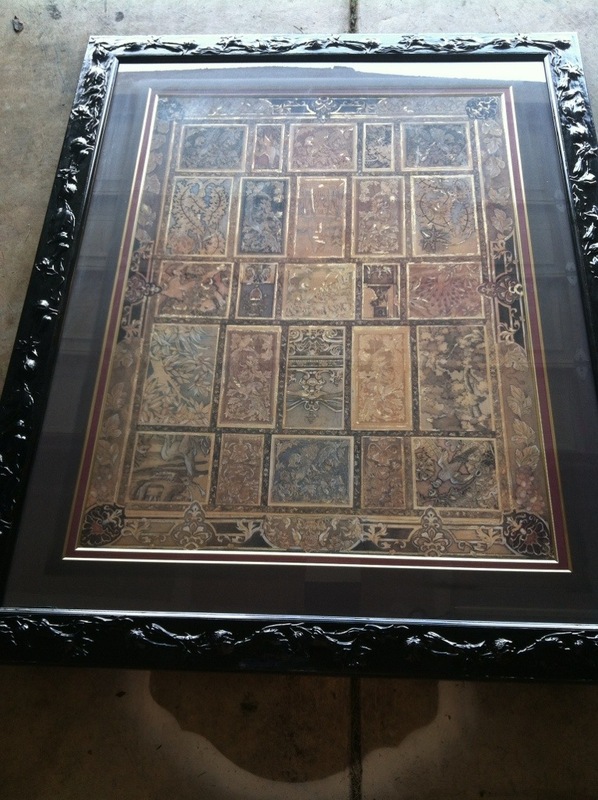 Step 1 – Find a framed picture, it can be anything. I would look for frames with cool details or an interesting design. 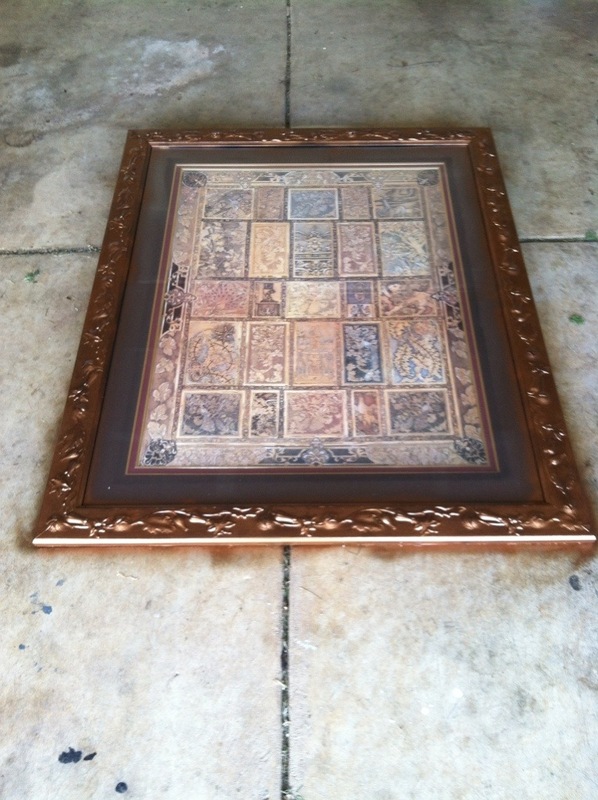 Check yard sales, thrift stores, and flea markets for frames. I had a large 3.5ft x 5ft painting that didn’t fit my decor that I decided to use. 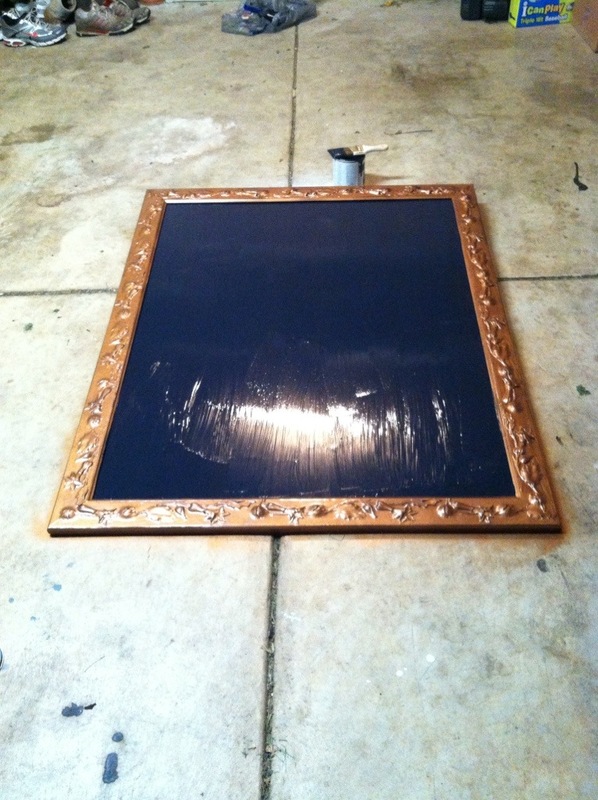 Step 2 – Spray paint the frame only, try to avoid getting paint on the glass, but don’t stress out if you do. I used a Valspar spray paint in copper. I would recommend spray painting in a garage with the door open or semi-enclosed area where debris won’t get on your paint, yet you still get ventilation, also lay down a tarp/drop cloth and place a brick or phonebook under each end of the frame so you can fully paint the frame. I didn’t do this and now have some awesome spray paint on my garage floor! Step 3 – When the spray paint on the frame has dried, mine was dry in about 20 minutes, begin painting the glass with chalk board paint. I would recommend using an angled brush that is 2-3 inches and paint using up and down brush strokes, always going back and forth in the same direction. I didn’t tape the frame, if you aren’t sure about your brush strokes, you may want to tape your frame. I used the same can of chalkboard paint I used on my pantry door project, a little goes a long way! Let the first coat completely dry. Chalkboard paint goes on looking slightly blue-gray, you will know it is dry when it is completely black. Then paint a second coat and let dry overnight. Step 4 – Select your fonts. I went into Microsoft word and played around with the different fonts, I had no idea there were so many! I ended up going with Lucinda Handwriting for my last name and established portion and I found a block letter M using google image search. I stayed after school one day and used my projector to trace the letter and writing on a large sheet of butcher paper. If you don’t have access to a projector, I would take what you want to a copy store and get it enlarged for a few dollars. Cut out your “stencils” and decide where you want them on your chalkboard. Placement is important, you don’t want too much space or too little space between the monogram, last name, and established date. When you have decided on your placement, trace your stencils with a pencil. Step 5 – Paint your monogram. I tried the chalk approach, I had read on Pinterest that if you dip chalk in water it will write nicely and last. This did not work for me, but I could have easily been doing this wrong! I ended up using a paintbrush and plain white paint leftover from painting our baseboards. I was so excited when I finished, that I had my husband hang my artwork up, and the paint dripped, I fixed it! Be patient and let your paint dry! 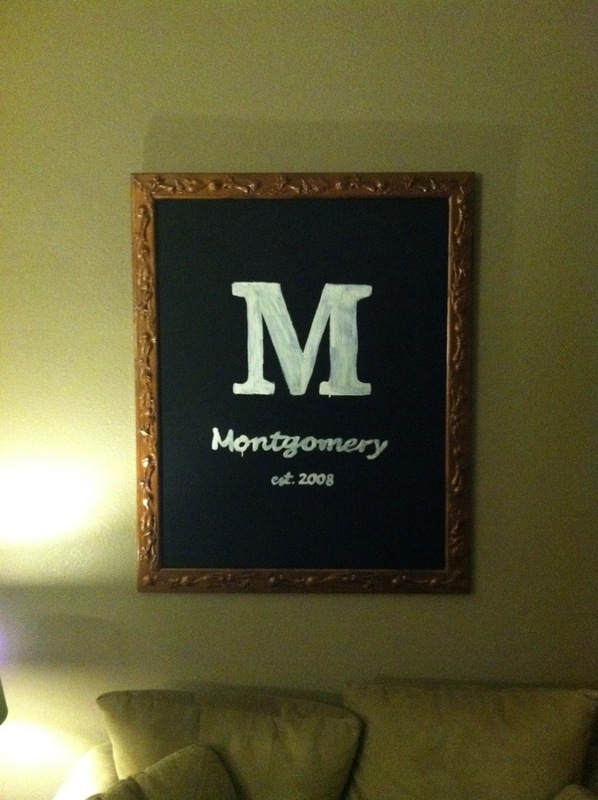 I think this was a successful and relatively easy chalkboard monogram project. Give yourself two days for this project, especially if you are painting a large frame, like I did. Materials you will need – paint for frame, chalkboard paint, paint brushes, chalk or white paint. Next Post May Photo a Day Challenge! Wine gives the best inspiration! : D Love the final result, I fear I would make a mess (I am NOT crafty at all!) but you did a fantastic job!! For sure! Some of my best and worst moments have been fueled/inspired by wine! Thank you! It really wasn’t terrible difficult, you could totally do it! Drink some wine and give it a try! LOL!